The Mexican drug trade is booming in local Arizona economies, and that makes access to illicit substances easier than in other parts of the country. In 2013, 22.7 million people across America needed treatment for a substance abuse problem and 20.2 million people didn’t get that treatment.3 Arizona has high hopes of changing the treatment climate within their state borders. In an effort to deter excess prescribing practices by physicians, prescribers are required to report prescriptions written every week to a statewide monitoring program, as are pharmacies.34 In addition, the state has followed in line with others before it to provide residents with safe ways of disposing of their prescription drugs after they’re finished with them. The rate of prescription drug abuse has also risen in Arizona. Just as there are laws against the use and promotion of these substances, there are laws that oversee the treatment side of the spectrum, too. To be employed as a drug and alcohol abuse counselor in the state of Arizona, you must hold at least an associate’s degree in the field of chemical dependency or an equivalent field, meet required supervised work hour minimums, and pass a written exam. >Between April 2010 and July 2015, the population of Arizona grew by 6.8 percent, according to the United States Census Bureau. It is easy to understand why so many people would choose to move into this state. The unemployment rate is relatively low, housing prices are also low, and the education level is comparably high. That means many people in this state have good educations, good jobs, and strong communities – and it shows. The Meadows: This treatment center is located in Wickenburg, Arizona. For more than 35 years, clinicians at this center have helped clients to overcome mental health and trauma-related issues, including addiction. There is a full spectrum of care available at The Meadows. Teams use individual counseling, group counseling, Eye Movement Desensitization and Reprocessing, somatic experiencing, equine therapy, acupuncture, and more. All of the services are provided on a beautiful campus that provides gorgeous views of the Sonoran Desert. The Meadows is a TRICARE Preferred Provider of treatment services to members of the military. Many insurance programs work with this provider, but people who plan to use insurance are encouraged to check with their insurance companies first. Intake professionals can help with that process. Financing is also available. Call (800) 244-4949 to find out more. Soberway: This facility provides addiction care in a family-style setting for people dealing with addiction. There are a number of different programs to choose from. Some are made just for young men, some for young women, and some are designed to assist with a specific type of drug. Therapy teams use a variety of different techniques in each program, including individual therapy, family therapy, and holistic therapies such as yoga and equine therapy. Treatments are provided in gorgeous home facilities in Prescott. Each home has a slightly different aesthetic. Insurance payments are accepted. To find out more, call (877) 917-6237. Decision Point: The developers of this treatment program believe that some difficulties called “addiction” are actually caused by mental illnesses and lifestyle challenges. As a result, people who enroll in this program are provided with a 15-day assessment period, so the team has a chance to uncover all of the factors that could be contributing to the person’s issues. Then, people enroll in additional treatment for 45 days or 90 days. People can use inpatient services, or they can participate in the company’s intensive outpatient program. Cognitive Behavioral Therapy, anger management, equine therapy, and relapse prevention are just a few of the treatments available. Facilities are in Prescott, Scottsdale, and Prescott Valley. Major insurance plan payments are accepted. Call (877) 772-3648 to find out more. Cottonwood Tucson: This treatment facility works in partnership with the University of Arizona School of Medicine. Together, they work to understand how addictions develop and how they can best be treated through assessments and interventions. All of that research is put to use in this treatment center in Tucson. People who enroll are provided with care for co-occurring conditions, including mood disorders and eating disorders, and they have access to a qualified team of mental health professionals that can deliver a number of therapies to help difficulties ease. Most people stay in the facility for six weeks, but some stay longer. Each room has an occupancy of four, and people are expected to work with their roommates in order to attain a full recovery. Aftercare services include 12-Step meetings, continued therapy, extended care facility referrals, and more. Insurance payments accepted. Call (800) 877-4520 to find out more. Arizona Addiction Recovery Center: This addiction treatment organization provides services to people ages 18-40. There are multiple locations in Arizona for people in need, including locations in Scottsdale, Tempe, Mesa, Glendale, and Phoenix. Many people fly in from other states to get care with this organization too. Some people take advantage of inpatient care, so they move into the treatment facility to get help for addiction. Others access outpatient care, so they can attend to home and work responsibilities as they heal. In addition to counseling services, the group encourages fun and leisure activities, including outdoor activities and gym membership, to help people remember how to have fun in sobriety. The group accepts insurance payments, but those without insurance can access low-cost options for care. Call (888) 512-1705 to find out more. The River Source: This organization believes in the concept of holistic healing. To them, it is not possible to separate a mental issue like addiction from a person’s physical and spiritual health. Everything is intertwined, and the treatment approach should be intertwined too. As a result, this group offers a number of alternative therapies to augment traditional rehab work, including nutritional therapy, meditation, yoga, and mindfulness. There are two locations in Arizona for clients to choose from. Insurance payments are accepted, fees are kept low, and there are financial assistance programs for people in need. To find out more, call (888) 687-7332. Sundance: It is difficult to recover from an addiction when you are surrounded by distractions. Sundance wants to help. This organization provides inpatient care for addiction, so people can get away from the temptations of home and into a new life of recovery. Men and women are in separate programs, so issues of gender are not distracting, and executive men can enroll in a program made just for them. Therapy is provided by licensed, trained professionals. The adobe-style quarters are incredibly warm and appealing. Insurance payments are accepted. To find out more, call (844) 877-8491. Women in New Recovery: Extended care can be the right option for some people living with an addiction. This facility provides that extended care to women, and it is located in Mesa. Women who enroll move right into the facility, and they spend every day working on recovery in the company of peers who know, on a personal level, just how devastating an addiction can be. As they progress, these women can move into a sober living environment, in which they have more freedoms but are still encased in the safety of a safe and clean home. This nonprofit organization accepts insurance payments, and is willing to discuss payment options for women in need. To find out more, call (888) 393-0544. Sierra Tucson: For over 30 years, the team of this organization has provided residential care for people with addictions. Men and women who are 18 or older are welcome to apply, even if their addictions are complicated by other issues, such as depression, eating disorders, chronic pain, or trauma. The team performs an in-depth assessment to determine the best path forward, and every person who enrolls has access to a team of licensed mental health professionals delivering state-of-the-art care. The campus includes a swimming pool, a labyrinth, a kiva, rock climbing walls, hiking paths, and a salon. Rooms are semi-private with full baths. Insurance payments are accepted. Call (855) 396-1913 to find out more. Desert Cove Recovery: This organization believes in delivering customized care for people who struggle with addictions. As a result, each treatment plan is carefully customized to meet the needs of clients. Options that could be used in that treatment plan include medical detox (through a referral), extended care, and outdoor therapy. The program is appropriate for people who have addictions, including addictions complicated by mental illness. The treatment facility is located in Scottsdale. Most major insurance program payments are accepted. To find out more, call (888) 971-1113. Valley Hope: This organization has provided addiction treatment since 1967. During that time, thousands of people have gotten help through the work and dedication of the treatment team. That work continues today, and there are several Arizona locations of Valley Hope to choose from. Services offered include medical detox, residential care, partial day care, outpatient care, continuing care, family care, and online therapy. Multiple payment options for care are available, including health insurance and financing. To find out more, call (800) 544-5101. Calvary: This organization believes that residential treatments provide the best way forward for people struggling with addiction. This group has a 2.5-acre campus that is dedicated to helping both men and women older than 18. People who enroll are provided with instruction in the way to recovery, with treatments that may include equine therapy, yoga, acupuncture, and/or EMDR. Counseling is also part of the treatment plan, and all counselors hold master’s degrees or more. People who want to explore a spiritual level of recovery can sign up for the faith-based track of care to gain a closer connection with God. There is also a family program, so people at home learn more about how to support a lasting recovery. Insurance payments are accepted. To find out more, call (866) 767-6237. Stonewall Institute: This organization takes pride in the fact that the treatment setting is warm and inviting. Clinical, hospital-like environments can make some people in recovery feel uneasy, so the developers of this program worked hard to make sure that the setting felt warm, inviting, and comforting. But the care is far from homespun. The team uses state-of-the-art approaches to combat addiction. All care is provided on an outpatient basis, and the staff-to-client ratio is kept small, so people have the personalized care they need as they recover. Major insurance program payments are accepted, and there are special pricing schedules for people experiencing financial hardship. To contact this Phoenix organization, call (602) 535-6468. Addiction Resources Incorporated: Drugs like heroin and Vicodin can change chemical signaling in the brain, and when that happens, it can be hard for people to develop a lasting sobriety plan. Medications can help, as they can quell cravings and allow people to focus on developing new habits. This form of assistance is available at Addiction Resources Incorporated. Counseling is also provided, so people can learn how to develop new habits that do not involve drugs. Every person who enrolls will see a counselor at least once per month. People who enroll must be 18 or older, and they must have at least a one-year addiction history. The staff speaks both English and Spanish. Clients are responsible to pay all fees in advance. Contact this Phoenix company at (602) 233-9401. The Pathway Program: This family-owned organization provides addiction treatments to people ages 13 to 25. These young people need to learn more about how to develop a healthy life without drugs, and they can get that help here. Treatment options run the gamut from outpatient counseling to residential care, depending on the circumstances and the needs of the young person. Parents are kept in the loop of the treatment plan, and in some cases, they are also offered counseling. Those counseling sessions can help parents to understand the challenges their young people are facing as they attempt to recover. No information about insurance payments or payment plans is readily available online, but interested families can reach out to the organization for those details. Call (877) 921-4050. Oasis Addiction Counseling: A traditional addiction treatment model involves moving out of the home and into a treatment facility that can help. Oasis uses a very different model. Here, people who enroll are asked to move into a nearby sober living community, where they can be surrounded by recovering peers in a controlled but not overly structured environment. Then, these people come to Oasis each day for intensive outpatient addiction care. This model provides significant savings over traditional inpatient models, and it can be a good choice for people who need to recover but who may not be able to afford a resort-style addiction program. Insurance payments are accepted, and admissions teams are available to answer any questions families might have. Call (855) 778-5375. Scottsdale Treatment: This program provides outpatient care in a nonjudgmental environment. Some people come to this organization due to a court order, while others engage through a sincere need to change a life inundated with drugs into something different and better. People who enroll are allowed to choose their own path to healing. Some choose individual sessions, others choose group sessions, and others choose outpatient therapy. Some augment their care with screenings and treatment for anger management or domestic violence. There are classes available on all sorts of addiction-related topics, including DUI. Those who need medication assistance for addiction can also get it in this facility. Insurance payments are accepted. Call (480) 429-9044 to find out more. The Sanctuary at Sedona: The founders of this treatment center wanted to create a healing environment that was different from the other options available in the community. As a result, they do not use 12-Step approaches in care, and they do not offer treatments with a clinical feel. Instead, they offer an integrative approach that attempts to draw together a person’s mind, body, energy, and spirituality into a picture of long-term health. The team provides counseling, recovery coaching, yoga, meditation, nutritional supplementation, wisdom teaching, and body work. The Sedona facility is very secluded, and only seven clients are accepted at any one time. That means everyone who enrolls has a great deal of privacy. And the grounds are simply breathtaking. No insurance payments are accepted, but there are financing options available. Call (877) 710-3385 to find out more. Community Bridges: This private, nonprofit organization has been in operation for more than 30 years. It is considered one of the largest statewide providers of mental and behavioral health care, including addiction. All programs are licensed by the state of Arizona. There are inpatient and outpatient addiction treatment programs to choose from, and people can also tap into medical detox services. The staff members and amenities available can be quite variable from one facility to another, but all are designed to help people in need. That extends to people with financial difficulties. No person will be turned away due to an inability to pay. Anyone and everyone who needs help can get it here. To find out more, contact the 24/7 helpline at (877) 931-9142. Canyon Crossing Recovery: This facility, located in Prescott, is designed for women living with an addiction. Women who enroll are asked to move into a women-only structured transitional living facility. Here, they live with other women in recovery in a sober-home environment. Then, these women participate in an intensive outpatient program for addiction on the campus, which includes 12-Step fundamentals, individual counseling, equine therapy, adventure therapy, and educational workshops. Insurance payments are accepted. Call (800) 651-7254 to find out more. Clean Adventures: This private organization is designed for men living with addiction. These men move into a sober living home located close to the main facility, where they are surrounded by other men who are also working toward recovery. During the day, these men participate in an intensive outpatient program that is designed to teach them how to change old behaviors and unfounded belief systems. Cognitive Behavioral Therapy, Rational Emotive Behavioral Therapy, and adventure therapy are all used in this organization. This model is quite cost-effective, and the founders suggest that the model they offer costs about a third of the costs associated with other forms of care. Insurance payments are accepted. Call (844) 433-8400 to find out more. A Better Today Recovery Services: Personalized therapy based on the needs of the person with the addiction is the goal of this organization. There are two locations in Arizona to choose from: One is in Scottsdale, and one is in Phoenix. Recovery begins with a comprehensive assessment, so the team understands how the addiction developed. Next, the team builds a treatment program that might involve individual therapy, group therapy, art therapy, equine therapy, family therapy, nutritional support, or yoga. Both inpatient and outpatient programs are available, and the organization can provide intervention services for people who have not decided to invest in getting well. Insurance payments are accepted, and financing options are available. Call (888) 906-0952 to find out more. Sol Recovery Center: This Scottsdale treatment center provides care for adults with addiction, and the team uses a personalized approach. 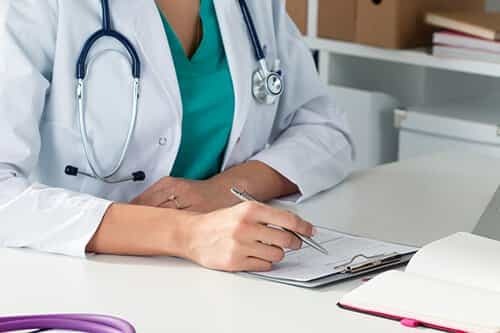 Potential clients go through a free and confidential screening process, and they are offered several different types of treatments to choose from. Some are inpatient, allowing people to move into the treatment center for help, and some are outpatient, so people can continue to live at home while they recover. There are aftercare programs available, for people who need a little extra support before heading back to the challenges of home. People who have addictions sparked by trauma can get specialized care for those issues too. The organization works with most major insurance companies. Call (866) 239-1700 to find out more. Awakening Recovery Center: This organization provides intensive outpatient care for addictions. That means people who enroll continue to live at home with the people they love, but they spend the majority of every day in the treatment facility, getting care for addiction. In that facility, they work with professionals who have over 30 years of experience providing care for people with addictions. Much of the work is done in a group format, but weekly or biweekly private counseling sessions are available too. There are aftercare services provided for a year after formal treatment ends. Most major insurance program payments are accepted. Call (480) 209-1977 to find out more. Reflections Recovery Center: This Prescott provider delivers addiction treatment to both men and women. Every person who enrolls is provided with an individualized care plan that can be changed or amended as the client grows in recovery. Therapy options provided include Cognitive Behavioral Therapy, experiential therapy, group therapy, Motivational Interviewing, Dialectical Behavior Therapy, and trauma therapy. Medication management, dual-diagnosis treatment, sober living, and life-skills training are all available for people in need. Insurance payments are accepted, and there is a transportation service available for people who might struggle to get to the treatment center without a little help. Call (866) 790-7979 to find out more. These are the top 25 treatment centers in Arizona, but rest assured that there are many more. Local hospitals may be able to provide medical detox services, and some provide follow-up care too. Small providers may also deliver outpatient counseling for addiction on a customized schedule. If you need help in Arizona, you can get it. All you need to do is ask. “State & County QuickFacts: Arizona.” (2014). United States Census Bureau. Accessed September 11, 2015. “State Estimates of Adult Mental Illness from the 2011 and 2012 National Surveys on Drug Use and Health.” (2014 Feb 28). Substance Abuse and Mental Health Services Administration. Accessed September 11, 2015. “DrugFacts: Nationwide Trends.” (June 2015). National Institute on Drug Abuse. Accessed September 11, 2015. “Income, Poverty and Health Insurance Coverage in the United States: 2013.” (2013). United States Census Bureau. Accessed September 11, 2015. “Arizona.” (2013). United States Census Bureau. Accessed September 11, 2015. “Profile of General Population and Housing Characteristics: 2010.” (2010). United States Census Bureau.Accessed September 11, 2015. “Poverty Status in the Past 12 Months.” (2013). United States Census Bureau. Accessed September 11, 2015. “Drug and Alcohol Addiction Statistics in the State of Arizona.” (n.d.). Digital Journal. Accessed September 11, 2015. “Methamphetamine Facts.” (n.d.). Drug Policy Alliance. Accessed September 11, 2015. Radnovich, C. (2013 Jan 21). “Report: Arizona has nation’s sixth-highest prescription drug abuse rate.” ABC News. Accessed September 11, 2015. Cleveland, C. (2015 Sep 10). “Arizona receives $3.6 million grant to combat drug overdoses.” Cronkite News.Accessed September 11, 2015. Huskinson, H. (2014 Mar 5). “For many Arizonans, drug abuse starts with a prescription, not a syringe.” Cronkite News. Accessed September 11, 2015. “Opioid Prescribing Safety.” (n.d.). Arizona Medical Association. Accessed September 11, 2015. Southwest Interdisciplinary Research Center at Arizona State University. (2010). 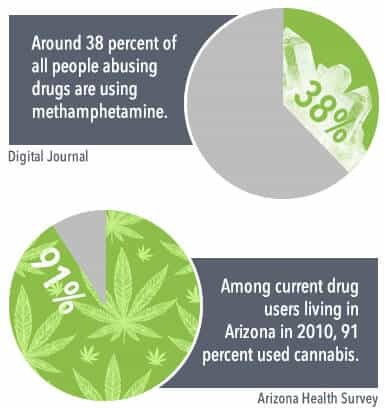 “Adult Substance Use in Arizona 2010.” Arizona Health Survey. Accessed September 11, 2015. “Youth Risk Behavior Surveillance — United States, 2011.” (2012 June 8). Centers for Disease Control and Prevention. Accessed September 11, 2015. “School Drug Use: Survey Finds 17 Percent of High School Students Drink, Smoke, Use Drugs During the School Day.” (2012 Aug 23). Huffington Post. Accessed September 11, 2015. Rivers, M. (2014 Jul 11). “Arizona ranked in top five states for alcohol-related deaths in CDC study.” Cronkite News. Accessed September 11, 2015. “Arizona Adolescent Substance Abuse Facts.” (n.d.). Office of Adolescent Health. Accessed September 11, 2015. U.S. Department of Transportation. (September 2000). “Age of Drinking Onset and Involvement in Age-Related Crashes and Other Unintentional Injuries.” National Highway Traffic Safety Administration. Accessed September 11, 2015. “Substance Abuse and Co-occurring Disorders.” (n.d.). National Alliance on Mental Illness. Accessed September 11, 2015. “Arizona Drug Control Update.” (n.d.). White House. Accessed September 11, 2015. “Reports.” (n.d.). Trust for America’s Health. Accessed September 11, 2015. Van Velzer, R. (2015 Jan 16). 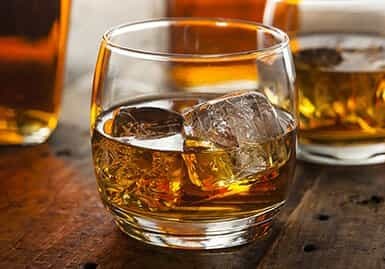 “CDC Study: Arizona 4th in U.S. for alcohol-poisoning deaths.” Arizona Central.Accessed September 11, 2015. “Alcohol-related deaths: How does your state rank?” (2014 Jun 27). CBS News. Accessed September 11, 2015. Halliday, R.C. (2013). “2013 Crime in Arizona Report.” Arizona Department of Public Safety. Accessed September 11, 2015. Martinez, J. (2011 Sep 18). “Arizona Drug Possession- Possible Punishment and How to Avoid it.” AVVO.Accessed September 11, 2015. “Arizona Laws & Penalties.” (n.d.). NORML. Accessed September 11, 2015. “Federal Trafficking Penalties.” (n.d.). Drug Enforcement Administration. Accessed September 11, 2015. 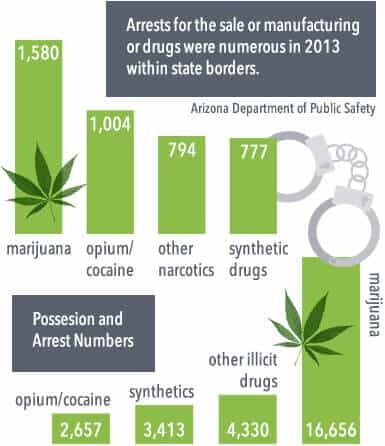 “Drugs in the United States: Arizona.” (n.d.). NC Buy. Accessed September 11, 2015. “States in Brief: Arizona.” (n.d.). Substance Abuse and Mental Health Services Administration. Accessed September 11, 2015. “Substance Abuse Treatment Facility Locator.” (n.d.). Substance Abuse and Mental Health Services Accessed September 11, 2015.Administration. Torrey, E.F., Kennard, A.D., Eslinger, D., Lamb, R. & Pavle, J. (May 2010). “More Mentally Ill Persons Are in Jails and Prisons Than Hospitals: A Survey of the States.” Treatment Advocacy Center. Accessed September 11, 2015. Bray, B. (2014 Dec 11). “America’s mental health disparities.” Counseling Today. Accessed September 11, 2015.